I don't do book reviews on From the Floor. Writing about writing about art is one step too far removed from the good stuff. But I've been working through a book recently that has impressed me enough to mention it here. The third chapter ("Toward Heterotopias") of Suzaan Boettger's Earthworks: Art and the Landscape of the Sixties does an exceptional job of telling the story about how Robert Smithson crystallized (pun fully intended) the ideas that became central to his practice. It's not often that one gets a picture as clear as this of how an artist solidifies a theoretical framework. 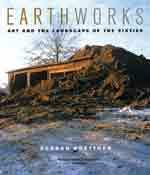 For devoted fans of Earthworks, or New Yorkers preparing for the Smithson exhibition planned for the Whitney this summer, Boettger's book is worth a read. And, as an added bonus, the book is filled with old New Yorker cartoons poking fun at the movement and photos of hirsute critics from the 1970s jetting around on Cornell University's private plane.